I like this curry very much. Mixing this curry with rice with a tsp of melted butter - MMMM its delicious. Here is the recipe. Take a pan, pre heat 1 tbsp oil, add mustard seeds, when it splutters add urad dhall and asafoetida powder and fry it to golden brown. Now add the chopped bitterguard to it. Add required amount of water, salt, turmeric powder and curry powder and let it cook for 15 mts. If the bitter guard is fully cooked (do not mash), turn off the stove and drain the excess water. Now turn the stove to low and add the remaining oil and let it fry in the low flame for another 10 mts. maximumm. This will become crispier. This is also a side dish. Bitter guard is good for diabetic patients. The process of making recipes with banana flower takes long time. This is another curry we make in our mom's place. This is basically a kerala Iyer recipe. Here is the recipe. Peel the banana flower layer by layer and take the black stem inside each tendril. Cut the tendrils into small pieces. Cook it with required amount of water, salt and turmeric powder and drain it after cooking. Keep it aside. Now grind the coconut and green chillies into fine paste without adding water. Keep it aside. Take a wide pan, pre heat the oil, add mustard seeds, urad dhall and curry leaves and fry it till golden brown. Now add the cooked banana flower to it and saute for a minute. Now add the coconut+chillies mixture to it and mix it thoroughly. Turn off the stove. This is also a side dish. Sweet potato is rich in fibre. Here is the recipe. Take a pan, pre heat the oil, add mustard seeds, when it splutters add urad dhall, green chillies and asafoetida powder to it and fry it till golden brown. 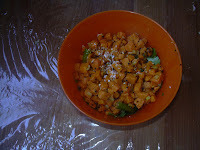 Now add the chopped sweet potato to it and add required amount of water, salt and turmeric powder and let it cook. When it is tender and fully cooked, turn off the stove. This is also a side dish. As I said earlier, This recipe includes a long process. 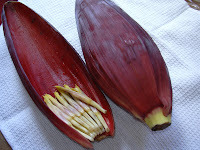 First, banana flower needs to be peeled layer by layer and in each tendril, there is a black stem (called as Kallan in Tamil), remove it and cut the tendrils into small pieces. Soak it in water with few drops of buttermilk in it. Also soak channa dhall, toor dhall, urad dhall , red chillies and green chillies for one hour. Grind it adding turmeric powder and salt (required for dhall only) into a fine paste. Steam cook it in a idly pan, for 15 mts. Allow it cool and scramble them. Keep it aside. In the mean time, drain the banana flower, cook it with a pinch of tumeric powder, salt(required only for banana flower) and 1/4 cup of water. Cook until it is half done. Drain it and keep it aside. Now take a pan, pre heat oil, add mustard seeds when it splutters add curry leaves and asafoetida powder and fry it till golden brown. Now add the steam cooked dhall to it. 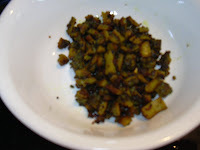 Fry it till the dhall becomes softer and add banana flower to it and saute until moisture leaves. Now banana flower paruppu usli is ready to serve. This is also a side dish. First cut the okra into small cubes. Wash it before chopping. All cut the tomato and onion into small cubes. Take a microwave safe vessel and put the okra in it and put it in the microwave for first 3 mts. take it out and stir it and again keep it for another 3 mts. By then, okra will be cooked. In the mean time, take a wide pan, preheat the oil, add mustard seeds, when it splutters add urid dal, cumin seeds asafoetida powder and curry leaves and fry it till it turns into golden brown. Now add the onion to it and saute for a minute. Add tomato pieces and again stir it for another 2 mts. Add turmeric powder, curry powder and salt it and mix it will. 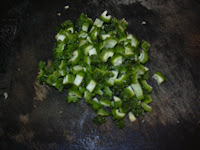 Finally add the okra to the above said ingredients and mix it thoroughly so that it mixes well with onion and tomato. Careful while using a spoon or spatula. do not mash or cut the okra pieces. 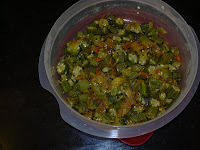 Now okra curry is ready to serve. I have never tried this before. Thought of trying this yesterday for dinner. It came out really well. Here is the recipe. First take a small pan, pre heat a drop of oil, fry all the ingredients given for masala powder, to golden brwon and grind it into a fine powder. Keep it aside. Now cook the cauliflower florets in the microwave for 5 mts. with a pinch of turmeric powder. When it is half-cooked keep it aside. Now take a wide pan, pre heat the remaining oil and butter, add mustard seeds when it splutters add cumin seeds and chopped onion to it and fry it till golden brown. Add the half cooked cauliflower to it and saute' for a minute. Now take a pressure cooker, put the rice (drain it after soaking it for 10 mts), add the fried ingredients, turmeric powder, salt and 2 1/2 tbsp (or acc to taste) of masala powder and pressure cook it upto 2 whistles. Make sure to turn off the stove after 2 whistles. Do not over cook the rice. When its ready to open, garnish it with coriander leaves. Serve it hot with raita and chips. My mother in law call this kozhambu as pathiya kozhambu. I don't know why she calls this as pathiya kozhambu but I like this kozhambu a lot. Here is the recipe. Tamarind - 3 tbsp paste or a medium lemon sized. Take a pan, pour a drop of oil, fry the ingredients from 1 to 7 to golden brown. Turn off the stove. Add the coconut and stir it with the fried ingredients. Let it cool and grind it into a fine paste. Now take a wide pan, pre heat the remaining oil, add mustard seeds, when it splutters add urad dhall and fenugreek seeds and fry it till golden brown. Now add the tamarind paste (or extract juice from the lemon sized raw tamarind) with 1 1/2 cup of water. Add turmeric powder and salt and let it boil for 3 mts. Now add the coconut paste we made before to this and let it boil for 10 under medium flame. Now add jaggery to it and let it boil for another 5 mts. If necessary add 1/4 cup water before adding jaggery. It will come to a thicker consistency. Now turn off the stove and add curry leaves and serve it with hot rice. 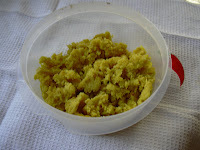 This kozhambu can be made without turmeric powder. It will look more darker, thats why I add turmeric powder. Also the recipe sounds more like milagu kozhambu, but we are adding coconut in this which we wont add in milagu kozhambu. 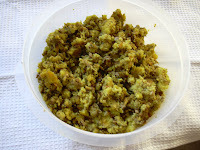 This kozhambu can be used for one week keeping it in the fridge. 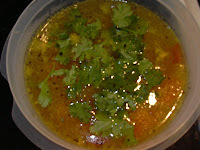 This is another variety of Rasam. This is very simple to make. Here is the recipe. Take a pan, chop the tomatoes, add a cup of water, 2 green chillies, turmeric powder and salt and let it cook for 10 mts. When the tomato is fully cooked add the cooked toor dhall with one or 1 1/2 cup of water and turn off the stove when the foam forms from it. Now take a small pan, pre heat oil and ghee, add mustard seeds when it splutters add fenugreek seeds, asafoetida powder, red chillies and the remaining green chilly and fry it till golden brown. Pour it on top of Rasam. Garnish it with coriander leaves. Let it cool for 10 to 15 mts. When it has come to the room temperature, add the lemon juice to it and mix it. We usually use this taro root (chepankezhangu in tamil) to make sambar, more kozhambu and spicy curry. This recipe is for curry. Here is the recipe. First peel off the skin from taro root and make sure there is no sand on it. Take a wide pan, add a table spoon oil, heat it. 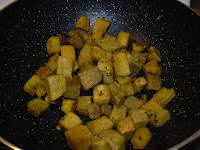 Add mustard seeds, when it splutters add urad dhall, Asafoetida Powder and fry it till golden brown. Now add the vegetable, required amount of water, Turmeric powder, salt and curry powder to it and let it cook for 10 15 mts. This is the time, it takes to cook. If we do this curry in a iron pan, it will become more crispy than if we do it in a non-stick pan. When it is 3/4th done add the remaining oil and reduce the flame. Let it cook for another 5 mts. This is another side, we make for sambar rice or rasam rice. Try this and lemme know your comments. Chena Masiyal - Tamil name for this recipe. Here is the recipe. Chenakezhangu - This is how we call this ham in tamil. I love this curry very much. After my marriage, whenever I go to my mom's place, my patti make is curry. Chena mezhukkupuratti - this is how she calls it. Here is the recipe. These are the required ingredients to make this curry. Very important ingredient we need including all the above is "Patience". If we need this curry very very crispier, then we need patience. First take a wide pan, pre heat the oil, add mustard seeds, when it splutters add the chopped yam to it. Pour required amount of water, put turmeric powder and salt and let the yam cook for nearly 20 mts. It takes that much time to cook. Make sure it is just cooked. Do not over cook. When it is tender, drain the excess water. Now add the coconut oil to it and mix it thoroughly. Reduce the heat to low and let it cook for more that 20 mts. Because, in order to become crispier, yam needs to be cooked in low flame and we need to stir it occasionally. When it is done, we can hear the crispy sound from the pan. This is also a side dish which goes well with sambar rice, rasam rice. First, pressure cook the potato adding a pinch of salt and turmeric powder and mash it. Remove the skin. Then grind the fresh coconut and green chillies together without adding water. The mixture should be dry and not like a paste. Take a wide pan, preheat the oil, add mustard seeds, when it splutters, add urid dal, red chillies, curry leaves and asafoetida powder. Fry it till it turns into golden brown. Now add the mashed potato to it, add salt and turmeric powder (if necessary, cos we have already added turmeric powder and salt while pressure cooking potato). Also add coconut mixture to it and mix it thoroughly with potato. Turn off the stove. Pour the coconut oil on top of the podimas. Now podimas is ready to serve. As I said before, this is awonderful side dish for pearl onion sambar. This is another simple curry I make when the vegetable box in my fridge is empty. My husband don't like this curry. He likes to eat carrot with salad. Here is the recipe. First wash and peel off the skin from carrot and cut it into very small cubes. Chop the onion finely. Take a wide pan, pre heat the oil, add mustard seeds, when it splutters add urad dhall, cumin seeds, asafoetida powder and curry leaves and fry it to golden brown. Now add the chopped onion and saute for a minute or two. Then add the chopped carrots to it. Add turmeric powder, curry powder ( See recipe) and salt to it. Add required amount of water and let it cook for 5 to 7 mts. When the carrot is nice and tender, it means curry is ready. If u see still some water in the pan, then drain it off and stir the curry under a low flame for two minutes. Now turn off the stove. 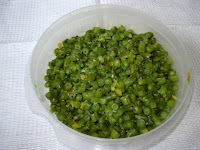 This is a side dish for rice and this can be used as a side dish for chapathis and pooris too. 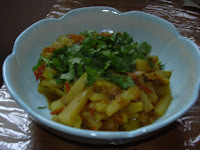 This is another side dish we make in most of our family. It takes less time and water to cook this vegetable. Here is the recipe. First cook cabbage and frozen peas with required amount of water. These two vegetables requires very little amount of water. Drain it and keep it aside. Now take a pan, pre heat oil, add mustard seeds, when it splutters add urad dhall, green chillies and curry leaves and fry it to golden brown. 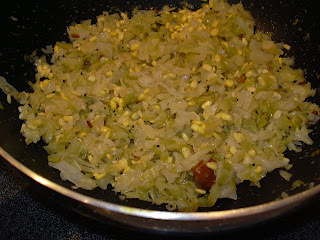 Now add the cooked cabbage and peas to it and saute for a minute. Now add salt and coconut and mix thoroughly. While mixing cabbage, we have to be very careful because cabbage will become mashy. Also we have to drain it fully before seasoning because usually when we add salt it will release some water. This is again a side dish for rice. This is another way of doing Cabbage curry. Here is the recipe. Nowadays people are becoming more health conscious. 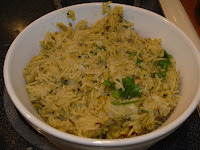 Here in this recipe in order to avoid coconut, we use moong dhall. Now lets go to the recipe. First soak the moong dhall for atleast an hour. Cook the cabbage with required amount of water and keep it aside. Now take a wide pan, preheat oil, add mustard seeds, when it splutters add urad dhall, asafoetida powder and curry leaves and fry it to golden brown. Now put the cooked cabbage and add salt to it. Mix it thoroughly and carefully. Now drain the moong dhall fully without a drop of water and mix it with cabbage. Mix everything nicely. Moong dhall compensates the taste of coconut. This is also used as a side dish. In english, we call it Cluster Beans. My mom used to make kothavarangai paruppu usli. I forgot to soak lentils for making usli one day. I finished cutting this kothavarangai already. So I started making this curry and it came out really well. Here is the recipe. First pressure cook the moong dhall with required amount of water adding turmeric powder to it. Do not over cook the dhall. Now cook the kothavarangai adding required amount of water till it becomes tender. Now take a pan, pre heat oil, add mustard seeds when it splutters add urad dhall, red chillies, chopped onion and asafoetida powder to it and fry it till golden brown. Now add the cooked kothavarangai to it. Saute for a minute. Now add just cooked moong dhall and fresh coconut to it. Mix everything well. This curry is a wonderful side dish for sambar rice, rasam rice and of course yogurt rice. Paruppu (in Tamil) means lentils or dhall. 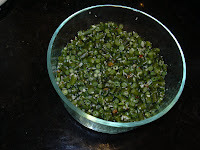 Usli is something where we use three kind of lentils i.e., toor dhall, channa dhall and urid dhall. We mix the cooked lentils with green beans. In my mom's place, we usually use this as a side dish for sambar rice and rasam rice. But in my MIL's place, we don't use this as a side dish, instead we use this to mix with rice and the side dish will be more kozhambu. Its basically paruppu usli rice. Here is the recipe. Grind the dhall + rice + turmeric powder + chillies + salt in to a fine paste. Steam cook it in a idly pan, for 15 mts. Allow it cool and scramble them. Keep it aside. Take a pan, pre heat oil, add mustard seeds when it splutters add curry leaves and asafoetida powder and fry it till golden brown. Now add the steam cooked dhall to it. Fry it till the dall becomes softer. Now add the cooked green beans to it and mix everything well. Turn off the stove. This is the traditional way of making paruppu usili. Another method is for present days quick cooking. 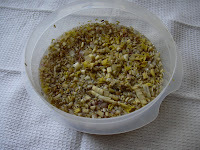 In this method also, we grind all the soaked dhall + rice adding salt, red chillies, green chillies coarsely. Careful while grinding the lentils. We should not mash the lentils. Put it in a microwave safe vessel. Add 3/4 to 1 cup of water, turmeric powder and salt to it and mix everything well. In this step, we can also add a tsp of sesame oil. Microwave it first for 3 mts. Take it out and stir it thoroughly and again microwave it for another 5 mts. By this time the lentils must be cooked. If not, then microwave it for another 3 mts. Now take a pan, pre heat oil, add mustard seeds when it splutters add curry leaves and asafoetida powder and fry it till golden brown. Now add the microwave cooked dhall to it. Fry it till the dall becomes softer. Now add the cooked green beans to it and mix everything well. Turn off the stove. This is a wonderful side dish. 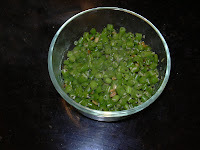 In the place of beans, we can also use banana blossom (vazhapoo) and cluster beans (kothavarangai). Try this and lemme know your comments. Here is the recipe for long beans curry. We call this as Karamani in tamil and Payathangai in malayalam. This is also a side dish. The process is similar to beans curry. First, Wash the raw long beans and chop it into small pieces. Take a microwave safe vessel and put the beans in it and microwave it for 3 mts. first. Take it out and stir it and again keep it for 3 to 5 mts. Make sure beans is fully cooked. Now take a pan, pre heat oil, add mustard seeds, when it splutters, add urad dhall and red chillies and fry it to golden brown. Add asafoetida powder in it and now add the cooked long beans to it. Stir it once and add salt and coconut to it. Mix it thoroughly. Now long beans curry is ready to serve. In our place, we use this as a side dish for sambar rice, rasam rice. Traditional way of serving food in south India is, first payasam, pachadi, sweet pachadi, kosumalli, curry, kootu, pickle and chips. I am trying to cover everything in this blog. Here is another receipe with beans. In order to make the kids eat veggies, we try all the tricks we know and some of them will work and some will not:-(. By the way this is the method my mom used to try with me when I was a kid. First, Wash the raw beans and chop it into small pieces. Take a microwave safe vessel and put the beans in it and microwave it for 3 mts. first. Take it out and stir it and again keep it for 3 to 5 mts. Make sure beans is fully cooked. In the mean time, pressure cook toor dhall adding 1/2 tsp of turmeric to it. Drain it fully. Now take a pan, pre heat oil, add mustard seeds, when it splutters, add urad dhall and red chillies and fry it to golden brown. 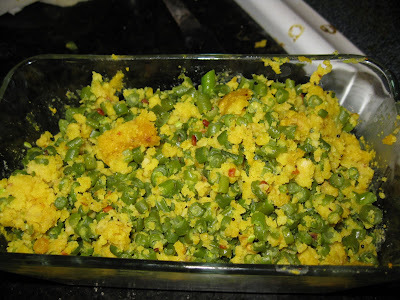 Add asafoetida powder in it and now add the cooked grean beans to it. Stir it once and add salt to it. Now add the cooked toor dhall and fresh coconut to it and mix everything well. Now Beans curry is ready to eat. This curry is a wonderful side dish for Sambar rice, Rasam rice. This is another way of making Beans curry. Here is the receipe. This is a common receipe which everyone of you know very well. Might be wondering, then why this receipe? Its for the beginners. When I was a new cook few years back, I used to spoil this curry every time, atleast for 10 or 20 times. But now I am doing good with this one. Here is the receipe. First, Wash the raw beans and chop it into small pieces. Take a microwave safe vessel and put the beans in it and microwave it for 3 mts. first. Take it out and stir it and again keep it for 3 to 5 mts. Make sure beans is fully cooked. Now take a pan, pre heat oil, add mustard seeds, when it splutters, add urad dhall and red chillies and fry it to golden brown. Add asafoetida powder in it and now add the cooked grean beans to it. Stir it once and add salt to it. Mix it thoroughly and do not mash it. Turn off the stove. Now green beans curry is ready to serve.